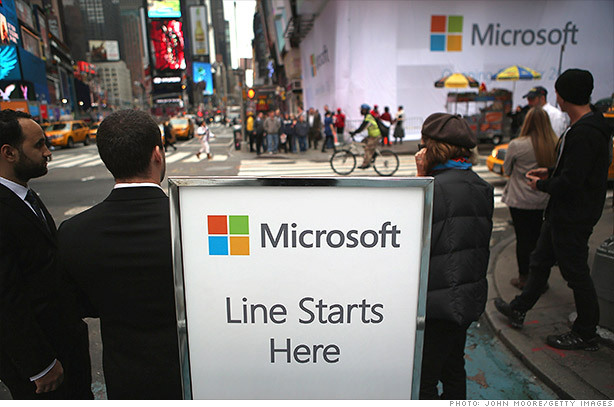 Microsoft (MSFT) reports earnings after the bell and investors are hoping the tech giant hasn't overpromised. Shares were up about 1% Thursday afternoon. The stock has had a rough year, what with flagging Windows sales and all, but Microsoft is hoping to turn things around. And this may be its time to shine. Windows sales have slowed for four straight quarters (year over year), but the advent of Windows 8 might offer the antidote to change that streak. Investors are hoping strong sales will offset an expected slump in PC sales, which have been hurt by the growing popularity of Apple's (AAPL) iPad. Also working in Microsoft's favor is Office -- its bread and butter. That's by and far Microsoft's biggest profit (and revenue) driver. But with Office 2013 on the horizon, there is some concern about a slowdown ahead of the new version. Investors are also keen to see how Xbox sales fared during the holidays. It's a 7-year old system but it has also garnered a loyal following. Microsoft has pointed to Windows 8 as a big catalyst for growth but the reception for so far been tepid. It remains to be seen if Microsoft can deliver on its promises and right now, there are still more questions than answers. Just take a look at what StockTwits traders have to say. Excellent point. My favorite analyst quote so far today comes from BGC Partners. "Haiku: Yes, there are problems. Tablets, Smartphones, and Win8. But it's not all bleak." That's right. Microsoft is still expected to report double digit growth. But will it be enough? Love that movie! But I digress. True, Apple has its challenges, what with worries about slowing demand for the iPhone 5 pushing its stock down 10% today. But does anyone really think Microsoft can come up with a phone to rival the iPhone? Oh wait, tried that already... not so much. But I will say this, there are other areas where the two tech titans can still face off. Either you're a Mac or a PC and tablets are still fairly young so if you aren't already married to the iPad, there could be room for Microsoft's Surface to gain some ground. If $MSFT beats Steve Ballmer's going to have the party of his life tonight. I wouldn't mind being at that party but it may take more than just beating earnings and sales forecasts for Ballmer to really break out the champagne. Windows 8 really has to hit it out of the park before I start singing "Let's get the party started." Questions I hope come up on $MSFT conference call. $DELL investment for real? What will Sacramento Kings be renamed after move to Seattle? Now those are some questions worth answering. Stay tuned.